Frosted Garden: iPhone or iCake? This was made for two of Rodney's co-workers. Every year when it comes to June, I have a hard time coming up with a common theme for these two dudes. They are very different people! One thing they do have in common though is that they both have an iPhone (along with everyone else at good ol' Charlie Uniform Tango) and a love for things Macintosh (again - along with everyone else at CUT). 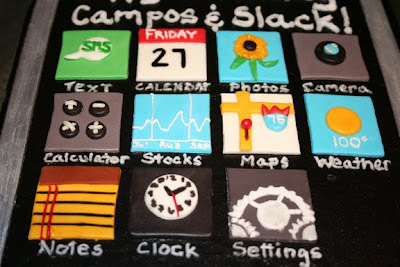 The idea of this cake was simple enough and the actual design was not difficult. The "buttons" are what were challenging. Challenging and time consuming. Rodney cut out each individual square and did we both did some work on each of them. Specifically, he made the highway sign, the text message box ( I piped it ), the phone, the iPod and the compass. I did all of the piping (both the stocks and the settings buttons were piped entirely with buttercream), the calculator, the notes button, the clock and the flower. The cake is triple chocolate with chocolate mousse filling and chocolate buttercream (tinted black). The silver parts of the phone are fondant painted with brilliant silver luster dust. I'm pleased with this cake. I think my words could have been piped a little cleaner but it was hard to gauge how much space I had when I was piping them. 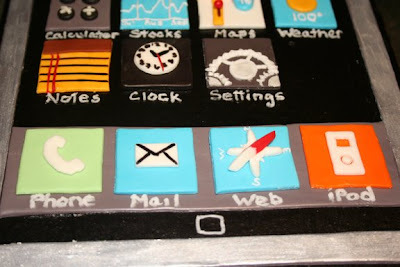 I really enjoyed making the buttons for this cake. It was a lot of fun to use the two different mediums to create what I was going for. I think they came out pretty good too! Close up's and one extra shot! That is so cute! I love it. You are amazing! Fantastic job on this one! Love it! A terrific job you did replecating an iPhone. 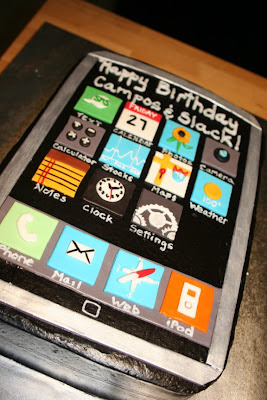 I have one and have often wondered what it'd be like to make a cake to look like it. Now I know. Awesome job! Looking forward to your classes. This looks great and the amount of detail, wow. With the upcoming launch of the new iPhone, I bet you could easily sell a bazillion of these to local retailers! Incredible work, as always! 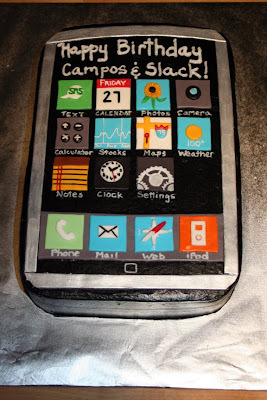 I think that's the first techie cake I've ever seen. Amazing!